- How To Break Dance, is a tutorial on how to learn the basic moves of break dance and some not so basic. 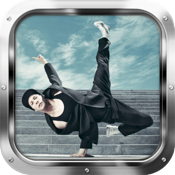 - A guide for beginners that allows you to learn several dance routines of break dance in just a few minutes. - Learn how to dance to the music, you'll be surprised of what you can do and people around you are going to freak out. - Access more than 25 tutorials. - Experience the sensation of following the teacher like you're in a dance class. - Combinations awesome for beginners using the 4 major styles of breakdance. Top Rocks, Freezers, Power Moves, Footworks. - Learn to follow the music with your movements, your attitude, your personal style, a feeling total freedom. - Learn how to mix various styles of dance once learned the basic movements. - Learn how to combine with other steps of each dance style. - Learn the technique and understanding of the movements to do so as quickly as possible. - You will feel in shape after repeatedly practicing these movements. - Master Teacher for over 13 years. - He has traveled in over 25 countries, compiting, master class, shows, special events, judging, etc..
- National and International Champion: Duelo del desierto x2, Talk is cheap, Red Bull BC One Qualifications Spain "El Circulo" Boogie Down Horsens, Freestyle session Spain, Etc. ..
- Originality and creativity is the personal style of Big George, but always using the foundation of this dance. - The most important thing in their classes is to explain why the movement, that the student understands the mind first and then do it in practice. - Crews: Malaganzters Crew & Urban Style Crew. - Big George is a good influence for youth, old people, medium, smaller, a super positive person who is always fighting for their dreams and support all those who want to fight for theirs and who not, just live on armony and pace.